Ok, our journey through the region of Burgundy, or Bourgogne as the French call it, was actually spread out across a few days. But there was one particular day when Petite Copain and I had to stuff our faces with a super-sized bag of plain store-bought madeleines. Before we get to that tale, let's begin our journey with the beautiful city of Dijon. At first glance, Dijon seems like a quiet, quaint little town. The next thing you think about is where the mustard is. If you're American, you'll fantasize about all those memorable 80's and 90's commercials of Grey-Poupon. If you've never seen these commercials, please click on this link and be amazed. Now, everyone should be able to understand my secret expectation of a fancy car slowly creeping up to serve me some Grey-Poupon out of the car window. Not that it did happen (DREAM CRUSHED!). Before coming to Dijon, I heard many so-called "facts" about Grey-Poupon... such as this mustard isn't actually from France but from Canada. And that it isn't really a French mustard, Kraft invented it, etc. Well, dear readers... I can sort out these misconceptions for you. Yes, Grey-Poupon originated in France. This dijon mustard was originally founded in 1855 by Maurice Grey, who discovered the recipe via a French monk who had secretly written it down after some epic, crazy battle trying to "patent" it the old fashioned way (aka espionage and naval attacks). After all of this drama died down, Grey created a certain machine that ground the mustard seeds into a paste and added some other "secret ingredients" such as vinegar to make the beginnings of what we know as Grey-Poupon today. Later on, Grey collaborated with another French mustard-making man to continue financing Grey's particular recipe. That man was called Auguste Poupon. Hence the name-- Grey-Poupon. From 1866 to 1946, Grey and Poupon continued to produce their mustard together before selling the recipe to American company Kraft! So there is some truth to all of the rumours, although the original tale is mangled with rumours. It's true that Grey-Poupon is now made with brown mustard seeds from Canada and not seeds from France like in the original recipe. The famous French mustard brand Maille continues to make a form of the original French version recipe of Grey-Poupon but only at its Dijon flagship store (and historically, original shop). Whoah, that was a lot of mustard-talking. To finalize my last thoughts on one of the greatest condiments known to man (besides ketchup... ahem), there are many artisanal mustards still made in Dijon... perfect gifts for your beloveds back home (or gifts just for you ;) ). Another popular mustard maker in Dijon is Edmond Fallot who loves to experiment with different flavors and intensities (yes, like wasabi intense). Petit Copain and I picked up curry-infused mustard, cassis or redcurrant mustard, and vin rouge or red wine mustard. All of them were to die for. Inside the Edmund Fallot shop. If you wanna take it further and see a bunch of Victorian-era dijon jars like in one of the pictures above (as well as amazing installations of real French shops from the 19th century), visit the Musee de la Vie Bourguignonne or Museum of Burgundy Life. It's a very odd but interesting museum, as the first-floor consists of old wax models forever depicting rural life in Burgundy (such as marriage traditions and a range of clothing styles that differentiated the poor from the rich). The second floor consisted of original installations of Victorian-era (and sometimes earlier) French shops. Petit Copain and I had such a blast from the past here... there was even an all-in-one Victorian candy store and pharmacy with original products from the era. You were forbidden to touch any of the products, of course... not that you'd want to eat ~200-year-old Victorian candy or pills... there's probably cocaine in it. Just kidding... right?? Anyway, back to the wonderful city of Dijon. Besides the mustard, you will find several medieval architectural delights. In Dijon, there are several crooked wooden houses reminiscent of Shakespearian times, little religious shrines carved into or affixed to random buildings, and a little bit of secret medieval mischief everywhere (funny little faces making fun of neighbors... maybe a hidden phallic symbol or two... perhaps early graffiti?). The fact that these remnants of another time still exist is astounding as well as memorable. Dijon is also known for its lucky owl, La Chouette. Supposedly, by kissing or touching this owl carving, it'll bring you luck. Well, all that rubbing and touching has made the owl look a little... down on its own luck? Yes, yes... I touched the damn thing too. I couldn't help it. Whether or not this owl will help me with anything has yet to be seen. The city has a special free walking tour called the Parcours de la Chouette that takes you through the city to find this owl. Even though there are blatant signs everywhere, it's actually hard to find La Chouette. It took Petit Copain and I about 40 minutes to figure out where it was until we found the crowd of people surrounding the owl carving. Hint: it's on the corner of a grand stone building (not a residency). if I had to think of anything lucky about my trip, it must have been my exploration of the indoor market, Les Halles, in Dijon. Much like in the style of the original Les Halles Market in Paris, this beautiful building is made of delicately arranged Victorian-styled iron and glass. I'm not sure if the architect of this building was the same man who created the Les Halles Market in Paris (before it was ripped down in the 70's), but it seems to be the case. You, my dear readers, know how much I love shopping at the marchés... and it's even better when real regional food and delicacies are being sold (instead of Made in China stuff) and not at tourist prices :P. Well... maybe the costs were reasonable due to the fact that I was accompanied by Petit Copain and his lovely sister. My French is good but not that good enough to always know if I've been shortchanged or not. One of Dijon's specialities is this ham, parsley, and gelatin formation called jambon persillé de Bourgogne. Petit Copain made a lot of berk sounds... the French expression of disgust (aka EWWWW). However, since I never tried the speciality myself, I forced him to buy us a large tranche (slice) for a picnic. As a back-up, Petit Copain made sure to load up on a lot of Comté cheese. I swear this man can live only on Comté, bread, and pasta for the rest of his life and be happy as a clam. "It is not so bad." With a shrug. AKA it was more than acceptable, if not tasty. Even though the Dijon Les Halles market is mostly indoors, it's so big that vendors also occupy space around the building as well as on nearby streets and in squares. You'll also find a lot of Portuguese products in addition to traditional Dijon fare. All are real treats you must try. And this market is a definite must-do if you're here in this city. Last, but not least, Petit Copain and I visited the Musee des Beaux-Arts de Dijon, a former palace that was once the home of the famous dukes of Bourgogne. 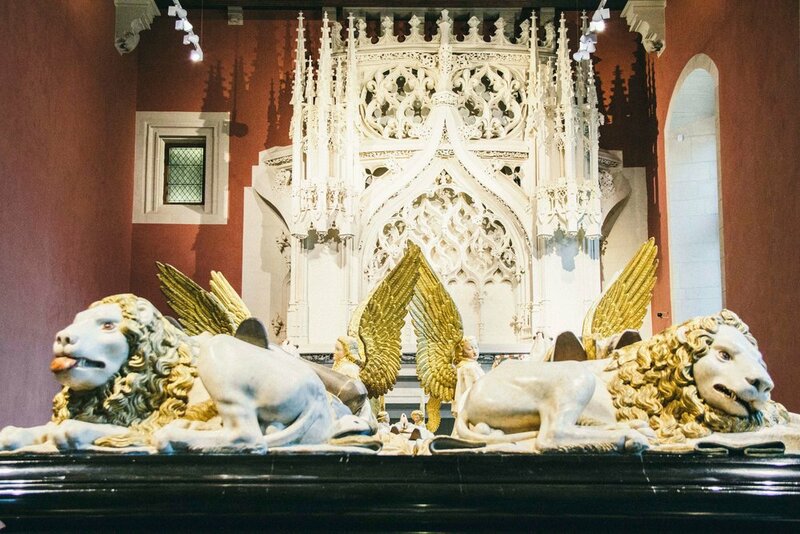 The museum has a spectacular collection of medieval paintings, artifacts, and even tombs of kings, queens, dukes, and duchesses alike. Next door to the Musee des Beaux-Arts de Dijon is La Tour Philippe Le Bon or The Tower of Philip the Good. Here, you can climb this enormous (totally phallic-inspired/grandiosely compensating for something) tower where you can have a beautiful view of the city. Make sure to come early and make a reservation to climb up the tower, as the guide/tour is only available at certain times and on certain days. I don't believe you can reserve online but only in person at the tourist office, conveniently located below the tower. It's worth the view. 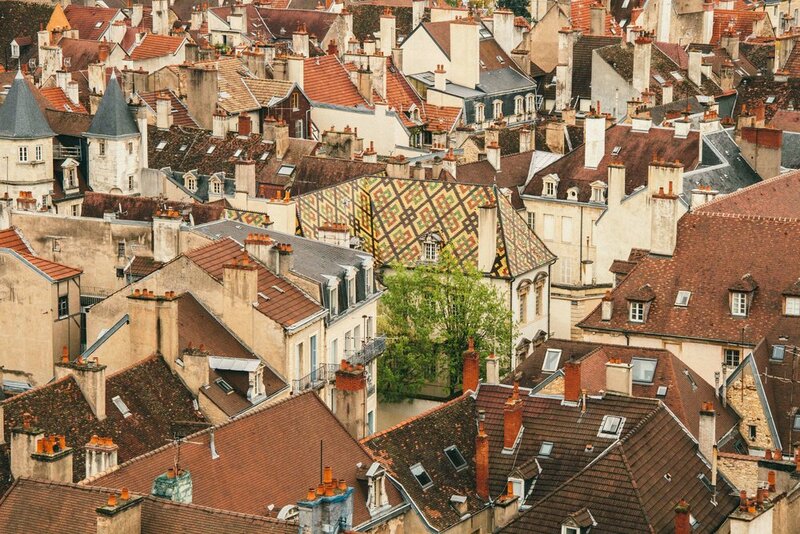 You'll see these beautifully colored, patterned roofs that are traditional to the region of Burgundy. They are not to be missed. This was a lot to write about for "one, tiny little city". Dijon may seem very calm or as they say in French, très tranquille. I loved my visit and I hope to come back soon. I don't think there's been a place in France I didn't love, besides the mess that is the Parisian metro or bus system (I'M TALKING ABOUT YOU, CHATELET). 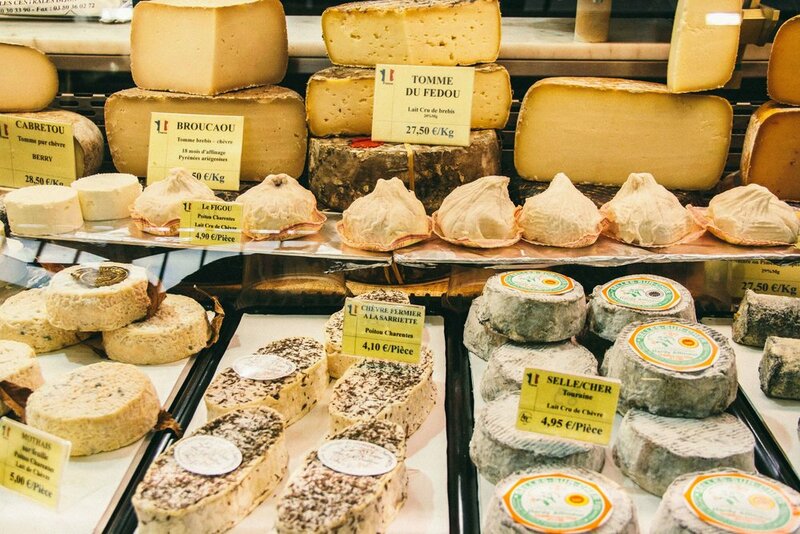 You will love Dijon. I promise.